This extraordinary beachfront penthouse is a rare masterpiece in architecture and interior design and includes every luxury imaginable. Custom designed by Architect Jesus Montoya y Trevino, famous throughout Mazatlan and other parts of Mexico, the 5400 square feet (500 sq. meters) of total living space is one of the largest penthouses in Mazatlan and the only one of its kind in the renowned Paraiso Costa Bonita Resort. 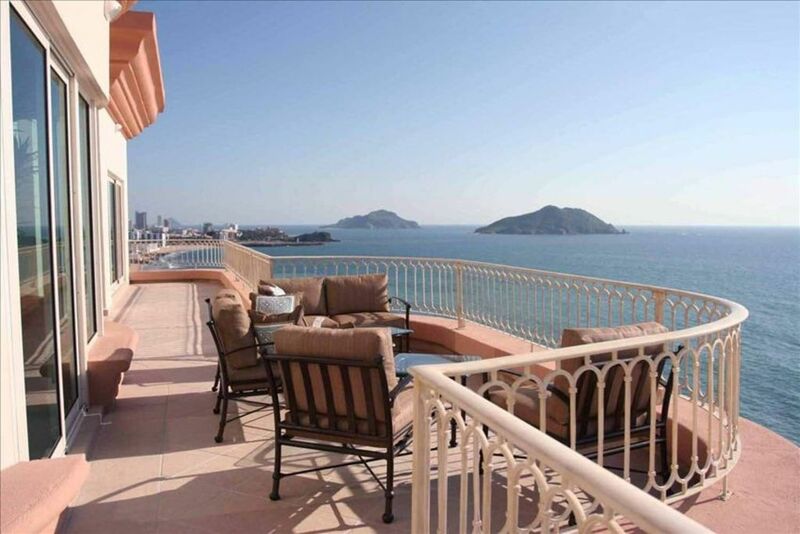 Uniquely positioned, the penthouse boasts spectacular panoramic views of the Pacific, neighboring islands, marina, golf course and the city of Mazatlan. The large, open spacious design, high ceilings and unobstructed ocean views results in an invisible barrier between the indoor and outdoors creating a unique and utterly relaxing experience. The Penthouse entrance features a private elevator stop, large arched hardwood door and hand carved canterra stone details. Upon entering, you will feel like you are on top of the world! This unique, single story Penthouse offers seven (7) ocean front rooms spanning over 110 linear feet (34 meters)! This consists of formal living, dining, and family room as well as four (4) ocean front bedrooms. In addition, a gourmet kitchen has views of the ocean as well as the marina, city lights and mountains. The walk-in bar features wine refrigerator, high capacity ice maker (bar style clear ice), and margarita machine. One of the ocean front bedrooms is part of a truly amazing master suite. This bedroom is truly fit for royalty and features king size bed with hand carved headboard, original paintings from Juan Trujillo, antique table and mirror, 37” LCD TV, walk-in closet, and bathroom featuring extra large Jacuzzi tub, extra large marble shower, bidet, two hand carved marble sinks, and built-in make-up table. The next two ocean front bedrooms feature king size beds and have their own, private baths featuring customized marble shower, sinks, and mirrors. The fourth ocean front bedroom has two twin beds and shares the hall bathroom immediately outside the door. The Penthouse sleeps eight (8) in true luxury! o	Fully stocked with all equipment including food processor, mixer and electric appliances. The Penthouse is located in the Paraiso Costa Bonita I resort. A separate beachfront cabana is available. This unit has a kitchen, full bath, dining area, and private deck located right on the sand! Both the Marina golf course and El Cid golf courses are seen from the back deck. Ocean View from all living areas and all bedrooms! Spectacular view from the dining room table. Dining tables are also provided on both the ocean front and marina view decks. 100's of CD's stored in Bose Soundsystem. Also, music channels available through satellite service. Over 110 linear feet of ocean front deck. In addition, a back deck overlooks the marina and golf course. Two pools. An infinity pool overlooking the ocean and an indoor/outdoor pool. We arrived in Mazatlan on the same day hurricane Sandra blew through. Our place was ready for us inside. The next day Claudia came over and arranged the decks, including cleaning all the windows, and arranging the outside furniture. The views from this very spacious condo are magnificent. We had a few issues that were quickly dealt with by Claudia and Gary, the owner. This condo has everything you could imagine and then some. We had four generations of our family staying at the condo. There was something for everyone. The Parisio 1, where the condo is located is superb. Super clean and well manicured. Eduardo at the front gate, Allen at reception, Jamie and staff at the Palapa were outstanding. Everyone in the complex were very helpful and made us feel like family. The security staff were always around making us feel welcome and safe. The food, beverage and service at the Palapa was excellent. There is no shortage of fine and casual dining, at reasonable prices, in Mazatlan! We had a fantastic time in beautiful Mazatlan. We will be back and will stay at the Penthouse again, if it is available. Truly is the best place to be at Mazatlán. the views are great. sure I will come back next year. The penthouse was a dream come true. Pictures don't do it justice. Stayed with husband, mother, mother's girlfriend, daughter and her girlfriend. Plenty of space to have quiet time. Staff is accommodating and hardly any challenges. Took time to get hot water, and no gas for grill. However, we would bring concern to Claudia and she'd address. Renee at front desk helpful. I hired a driver/ guide for mom and friend for five days through Renee, and it was huge success. Drivers name is Humberto and highly recommend him. Also had cabana. Total hit for daughter and friend to be right on the beach. Lovely location, grounds were well-maintained, and very safe. Stunningly beautiful! That is your first impression and it includes views in 3 directions as you enter the penthouse. The impression grows (and stays) as you wander to the far end of the cathedral corridor to your master suite and its royal bath - truly your own personal spa! All your guests are equally pampered in their own suites and the common areas are exquisitely appointed and more than comfortable. The kitchen, bar and patio BBQ are an entertainer's dream but make it difficult to get your guests out to restaurants! When you do, you'll discover that it’s easy by bus, taxi or pulmonia to get to some of the finest restaurants Mexico has to offer. There are also plenty of reasons to stay put. The onsite restaurant serves delicious and reasonable fare and there are other options within walking distance. A new shopping area nearby makes it easy to stock the kitchen and the shrimp vendor walks along the beach daily. We had various family and friends - ranging in age from 15 to 98 - visit for a total of 3 weeks. All thoroughly enjoyed themselves. Highlights included bottom fishing, parasailing, zip lining, beach walking and swimming in the ocean and the pools. It is comfortable in the evening to enter the warm pool at night from indoor where it’s protected from cool night air and then swim to the outside to pop up and stargaze before heading to the hot tub. All of the staff were welcoming, helpful and able to accommodate every request and the rental manager(s) were available 24/7 to answer any questions. I'm afraid to say more because I'll find this perfect place already booked next time! We came down to celebrate my parents 50th wedding anniversary! I wanted the week to be special so I did lots of checking around. I had several calls with Gary to understand if it would be OK for my dad who has limited mobility. I also wanted to make sure that we would all feel comfortable and that there would be sufficient activities for the "kids".... we are all in our forties! It all turned out great. My parents began to cry with joy when we first entered the Penthouse as it was so stunning! Mom and dad could not have been happier and our visit could not have been more memorable. We stayed in the Penthouse at Paraiso for 2 weeks this past year. It was truly incredible. I have never been in a nicer resort or condo. My only regret is that we didn't stay longer! Jaime, Daniella, Jesus, and the rest of the staff were all so nice. We ate most of our breakfast and lunch meals by the pool. The food was excellent and so reasonably priced. For rentals less than 2 weeks, there is an additional fee. Beachfront cabana is available for additional $350 per week. Christmas, New Years, and Easter are subject to an additional $400 fee.